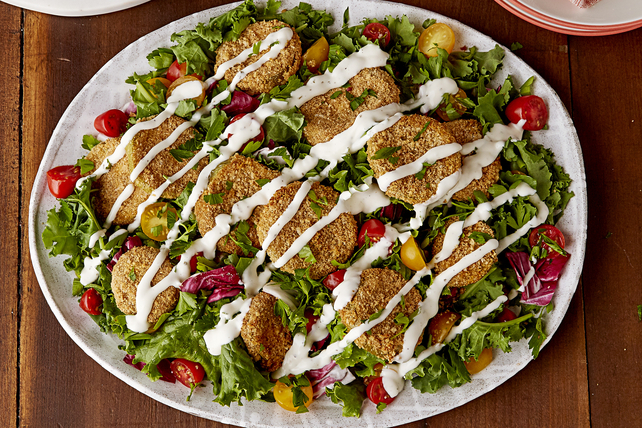 Toss green tomatoes in with mixed greens to make our "Fried" Green Tomato Salad. Cherry tomatoes add even more colour to our "Fried" Green Tomato Salad and when "fried" green tomatoes are this crispy, who would guess that they're actually oven baked? Cover baking sheet with parchment. Whisk egg and water until blended. Empty coating mix into shaker bag. Dip green tomato slices, 1 or 2 at a time, into egg, turning to evenly coat both sides of each slice with egg. Add to shaker bag; shake to until evenly coat tomatoes with coating mix. Place on prepared baking sheet. Bake 10 to 12 min. or until crisp and lightly browned. Place salad greens on large platter; top with cherry tomatoes, green tomatoes and parsley. Drizzle with dressing just before serving. Substitute grape tomatoes for the cherry tomatoes.